At the back of a parking lot on Ste-Dominique lies a piece of art that is one part graffiti, one part calligraphy and one part hidden message. 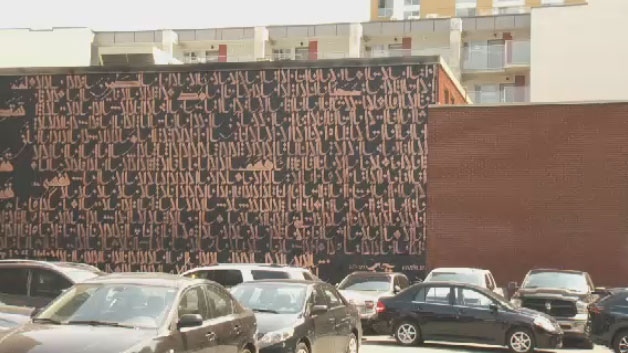 While at first glance, the mural looks like an ancient script, it’s hard to pin down which one it is, exactly. And that’s the point, according to the piece’s creator, caligriffiti artist Karim Jabbari. Hidden within the copper paint is the real meaning – a verse from a Tunisian poet, critical of those who are quick to judge others. Shirley Steinberg, a University of Calgary professor specializing in youth and Islamophobia, said she believes Montrealers should be proud of the mural’s message. The mural was created as part of the annual Under Pressure graffiti festival and took Jabbari three days to complete. While it occupies space on the side wall of a mosque, Jabbari said that was unintentional. The real purpose was to get across a message about the innate humanity of everyone. “If you’re looking for me, you can find me beyond your hate,” he said. Artists Karim Jabbari took three days to complete this mural on the side wall of a mosque, within which there's a hidden message about not judging others.